Speaker Rebecca Kadaga has adjourned the House to tomorrow (Tuesday). File photo. 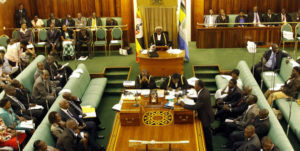 PARLIAMENT–The Speaker of Parliament, Rebecca Kadaga, has adjourned the debate of the Age Limit Bill to 10:00am tomorrow, citing faulty microphones as reason. At the time of adjournment, debate on the bill was already ongoing thanks to suspension of Parliamentary rules 201(b) which had proved to be the biggest hindrance to have the bill through. Rule 201(b) which states that the report be debated at least three days after it is presented contrary to what was happening in the House since it was today that presentation had been made. However, the Attorney General, Mwesigye Rukutana, moved a motion to suspend the rule and this came to pass. But this didn’t happen without protest from Opposition MPs whose procedural matters had all been rejected. “There is a proposal that the term of office be increased to seven years from five years which we did not consult our constituents…,” MP Winnie Kiiza, the Leader of Opposition argued as she tried to oppose the suspension of Parliamentary rules. “We are debating a private members Bill which was brought before the house by a private member after the Attorney General failed to bring a Book as guided by Court. Why is this matter so urgent yet he failed go respond to the court ruling that was directed to him,” Winnie Kizza wondered. Gen Elly Tumwine, though, argued that “we are here as Hon MPs to defend our image which has already been damaged… The idea of a multi-party dispensation, there are two sides and a middle side who wish you well… (order).. I am moving that the question be put and we move on”. But when he took to the floor, MP Abdu Katuntu responded to Tumwine by reminding him that interpretation of the law is a profession. “Interpretation of the law is a profession. If it was a military question, Gen Tumwine would be suitable, but since it is within my profession, he should leave it to us,” Katuntu advised. “We know at the end of the day, those with numbers will win. But must we act like a mob? Why are you running from your people? Is Uganda ending today?” Katuntu asked. But MP Mugoya argued that if the suspension of parliamentary rules is not prohibited by the law, then it is allowed. The rule was indeed suspended and debate went on until “microphones stopped working well” henceforth adjournment of the debate.